With good circulation, careful maintenance, starting with small specimens... some cnidarians can be mixed. I have been re-aquascaping my aquarium recently; I really wanted to create a cave so the contrast between light and dark looked really dramatic. 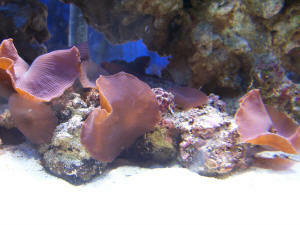 It looks good and allows the corals on top to get the best possible light from the halides. I was wondering if there is any corals that would thrive in the relatively low light space in the cave at the bottom of the aquarium as I thought it would look good if I could get a certain coral established, any suggestions? Hello Deanna! I do like your idea regarding contrast in aquarium areas'¦ I find that too consistent an illumination not only looks drab, providing an unnaturally bright landscape, but that this is hard on the life in the system; for the species that can choose to 'get out of the light'. And you are right in identifying 'corals', the disparate groups of stinging-celled life (Cnidarians) casually labelled as such, as being more or less light intensity liking. A good clue as to 'who goes where' can be had by examining a photo or video of a natural reef. You'll see that the principal families of reef-building, aka hermatypic' corals are the stony (Scleractinian) families of SPS, the Acroporidae, Pocilloporidae and Poritidae'¦ with more fleshy hard corals found in deeper, and generally less well-circulated habitats below. In practical terms, the groups of 'corals' called Polyps (Stoloniferans), Zoanthids (aka 'sea mats'), Mushrooms (Corallimorphs), and some of the soft corals particularly the Leathers (Alcyoniids), the Pulsing (Xeniids), and some of my favourite stony corals like the Plates (genus Fungia and Ctenactis, not Heliofungia) are good to great choices for lower spots and direct on-sand placement. If you'll allow, I would like to make a few general comments re the mixing of the phylum Cnidaria (the stinging-celled animals) life in hobbyist systems. A hodge-podge approach to stocking is not to be undertaken'¦ with all this life having potent offences and defences to ward off its neighbours'¦ It is only advisable to thoroughly study the life habits of all potential purchases ahead of their acquisition. Indeed, to develop a stocking plan (ask your stockist for help here, and keep a good list of what you already have, would like to add), that incorporates putting in the more sensitive, less noxious and stinging life ahead of more aggressive species. Do try to procure captive produced stocks (these are much tougher and resilient), and small specimens, and allow these to grow up together. Much, MUCH more could be stated re the above cautionary statements. I strongly advise that fellow hobbyists read books, magazines, attend hobby clubs and conferences'¦ generate a network of fellow aquarists for input in these matters. I am from India. Here the problem is temperature and power cuts ( i am talking about 4 to 8 hrs). You can run a fish only tank or even an anemone tank with the skimmer (but you can forget about the heavy wattage lights) in an inverter for so long. But there is no way you can run a chiller that long. 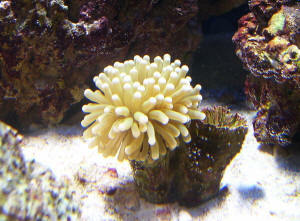 So i was wondering are there beginner corals that can withstand this heat. Here they use diesel generators to power their chillers (which is viable for rich guys but at the price diesel is selling us moderate guys can't?). Since you have a very wide knowledge please reply?